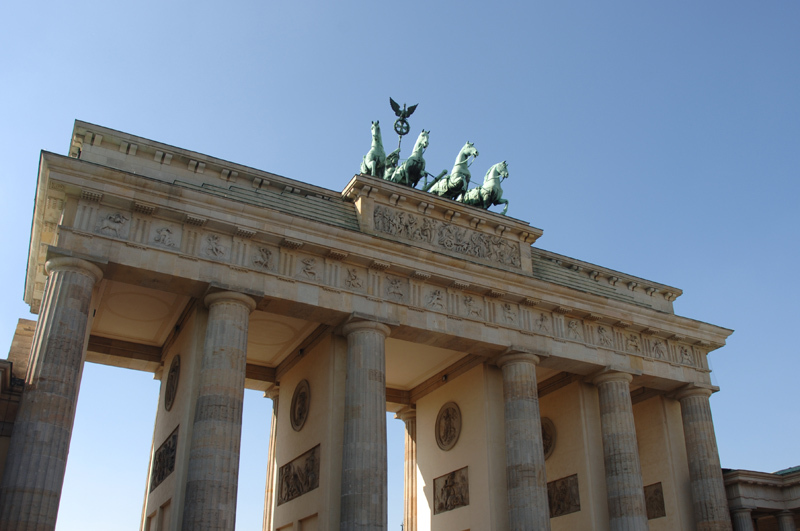 The Brandenburg Gate is one of Berlin’s most renowned constructions and is located in the Mitte District of the city. It is an arch of triumph located between the Avenue of the 17th of June and Pariser Platz. It was built at the end of the 18th century, taking the entry gate of the Acropolis in Athens as a model. Although it is the only one remaining today, there were originally eighteen such gates in Berlin. This work of sandstone was built following the neo-classical designs of Carl Gothard Langhans and measures twenty-six metres in height, sixty-five and a half in width and eleven in height. It was inaugurated in 1791 and given the name ´Gate of Peace`. It has five passage ways, the one in the centre being the widest. Its six columns are in the Doric style and the upper sections as well as the interior of the passage ways are decorated with base-relieves representing the Gods Hercules, Mars and Minerva. The four-horse drawn chariot found here was added a little later in 1795. It was designed by Johann Gottfried Schadow and is a copper sculpture measuring five and a half metres, portraying the Goddess Victoria, although some claim it to be of Irene, Goddess of Peace. The figure holds the reins of a chariot pulled by the four horses heading towards the city. The truth though is that the present day model is actually a copy, the original having been almost completely destroyed by bombing during the Second World War. It may be of interest to know that the sculpture was seized when Napoleon occupied Berlin, and ended up being sent to Paris in 1806. Eight years later, when the French leader was defeated, it was returned to its rightful home. Later, a Prussian eagle on top of a laurel crown surrounding the steel cross of the Goddess’ bastion, was added – a new symbol of power designed by the Prussian artist Schinkel. During the Second World War the gate was one of the few emblematic buildings that survived the bombing. The governments of both East and West Berlin ordered it to be restored. Despite all this, the construction of the Berlin Wall in 1961 meant it was closed completely. After the wall came down, there were incredible scenes involving the citizens of both parts of the city in the gate’s vicinity between East and West Berlin. We should remember that the wall passed just behind the gate and for almost thirty years it was not possible to cross it in any way. In fact, even today, if you pay close attention, you can see paving stones on the ground that mark where the old wall used to stand. Right after learning about its fall, a great many Germans came to this part of the wall to celebrate. Today it is still quite an experience for Berliners to pass through the Brandenburg Gate’s arches, for it has only been possible to do so for a relatively short time. Amidst the great activity produced by the city’s renovation after reunification, the Brandenburg Gate was restored. What was once a symbol of Berlin’s division, is today one of unity. Always lively, in the area to the north you will find the ´Raum der Stille`, or Hall of Silence, where you can meditate and enjoy great calm and tranquillity. To the south is the tourism office. All in all this is a place which can be enjoyed as much in the day as at night.